"Shenyang J-31 (F60) at the 2014 Zhuhai Air Show" by wc - http://www.airliners.net/photo/Untitled-(AVIC)/Shenyang-J-31-(F60)/2542713/L/. Licensed under CC BY-SA 4.0 via Wikimedia Commons. 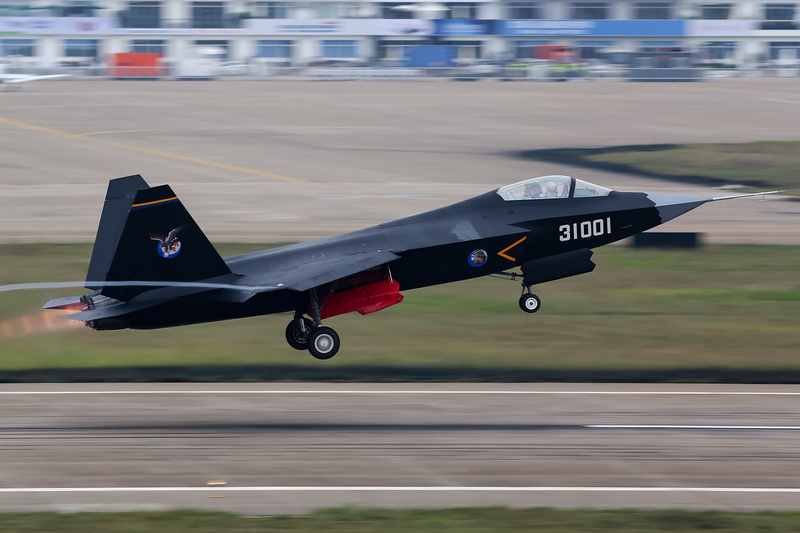 China is developing two stealth fighters - the J-20, an analog of the US F-22 Raptor for use by the PLAAF and PLAN; and the J-31, a US F-35 analog, for export customers. The J-20 first flew in January 2011 and is expected to enter service sometimes after 2018. The J-31 first flew in October 2012 and was showcased during the recent Zhuhai Airshow indicating that its development is on track. Putting it bluntly, it is likely that the J-31 could enter PAF service by 2020! As things stand, IAF air defense systems would not be able to track and engage PLAAF J-20 fighters; they could enter and exit Indian airspace with impunity! PAF J-31s would be somewhat easier to track, but our fighters would not be able to track and engage them in head on mode using their radars. To make matters worse, the Putin visit is over with nary a word on the FGFA. The AMCA is tottering at the edge of oblivion with ADA still struggling to firm up the design of LCA Mk-2! (ADA won't have time to seriously take on the AMCA for another 10 years!) Under the circumstances, the future must look grim to IAF planners. Time is running out. In order to meet the looming threat, the IAF has to do things more substantive then release a new version of their 3D combat game. Yeah, I know I am being mean. I am just venting, because guess what? It turns out that the IAF is indeed ahead of the curve. The IAF on December 2, 2014 released a RFI for development of a Passive Surveillance System (PSS) - a ground based system to be deployed in field areas for generation of 3D Air Situation Picture (ASP), by detecting and processing chance RF spectrum emissions and EM reflections of other transmissions in the vicinity of airborne platforms. Here are the deets excerpted from the RFI. The PSS will intercept, process, analyze and generate all types of Radar transmissions across the complete band of Radar Operation Radio Frequency bands (30 MHz to 18 GHz). It will provide location and dynamic tracking of airborne, surface (ground and marine), mobile and fixed targets. The system would be capable of detection, location, identification and tracking of active and passive targets within its area of coverage. The system will comprise of a cluster of sensor stations all reporting their detections simultaneously to the Master Receiving and Processing Centre which will process the information for detection of targets and formation of tracks. The system should be highly mobile, vehicle mounted with very less deployment time. Passive Coherent Location Based Surveillance System to detect presence of targets using reflected RF emissions available in the environment. Elint Based Surveillance System to detect, track, locate, correlate and identify intercepted RF emissions of the airborne platform in the area of deployment and process this information for generation of 3D Air situation picture. Air situation picture generated in both the systems would be integrated to form a comprehensive air situation picture. The output is to be in user defined format for integration in command and control system of IAF. The system would consist of a network of receivers and a master station and will generate its own 3D air situation picture without any active transmission of its own. Detection of 2 sq-m RCS target at more than 300 Km of range. Detection of targets from low level to very high altitude. Estimating target coordinates in space namely range, azimuth, height and Doppler. Radar Finger Printing (RFPS) through correlation and identification of emitter with data library. Remote operations including switching ON/OFF and operations of BITE, from an ops shelter located upto a distance of min 5 kms from system through OFC /radio link/ Satcom. The system should be vehicle mounted and capable of deployed in all types of terrain including mountainous region. Deployment of the system should be quick and mechanized requiring minimum manual intervention. The system should be self sufficient to meet camouflaging requirements(internal camouflage). Elint based passive system should comprise of multiple sensor stations and a control station. The system is to be capable of generating a real time 3D air situation picture based on intercepted data of airborne emitters. The system should have very high DF accuracy in terms of degree RMS for various frequency ranges. Capability to intercept signals from all types of radars (pulse, pulse Doppler, CW), TACAN/DME interrogator, SIF/IFF interrogator and transponder, jammers, Data link and any other electromagnetic pulse and CW emitters on airborne platform. A passive air surveillance system like the one contemplated by the IAF isn't a complete solution to the emerging stealth threat, but it's an essential first step. The PSS would give the IAF an ability to detect the presence of stealth aircraft, but not track and engage them using SAMs. A well executed PSS would allow IAF fighters to be vectored to the general area of intruding stealth fighters. allowing them to use their EO for further detection, tracking and engagement of enemy stealth fighters. Let's be clear, its early days for counter stealth technology. If IAF's PSS plans are news to you, its because you aren't a IDP Sentinel members. The RFI details were published on IDP Sentinel nearly a week ago!